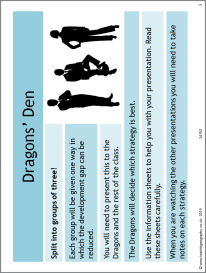 A Dragons' Den style activity where students pitch their ideas about the different ways to reduce the development gap to the Dragons. Students work in groups using information sheets to help them understand the seven main ways that can be used to reduce the development gap. All the resources required are included, but use of research tools could also be useful to gain additional knowledge.